In my various interviews over the past year, a common theme of mine has been the relationship between design and development on the web. I am curious to hear your thoughts on this as well. As someone who dabbles in the creation of web sites as a hobby and follows the true professionals online, it appears that there are not a lot of people who are highly skilled on both sides of this fence. It seems like most folks tend to spend more time on one side over the other and their career sticks on that path. That seems to be changing somewhat in recent times, but overall I think the sentiment still holds true. As someone who has worked in the industry for more than nine years, do you agree with this? Is it hard for a person to be highly competent at design and development when it comes to the web? From a quick reading of garrettmurray.net and looking at your portfolio, it might be easy to assume that you are a more of a developer yourself. What would you call yourself? Where are your strengths? Oh, I'm definitely a developer, yes. I have been saying for years that I'm not a designer, but it gets harder and harder to say that with a straight face when you look at how many times I've redesigned my personal weblog (maniacalrage.net) or the various other sites and projects I've done recently. That being said, I still don't consider myself a designer in professional terms, because I never design for clients. All my design work is for my own projects--things like Ego, my sites, other web applications--I'm the client and I'm not forced to work on a deadline. I could never be a designer by trade because I'm not particularly good at it in regular intervals. I get inspiration, I sit down, I knock out a design. But then I might not design again for two months. If I had to do it every day, I would be a horrible failure. When it comes to development, however, I am able to focus and work harder on a regular basis. It's interesting that of all my interests and hobbies (design, filmmaking, comedy, writing), development is the least creative in a general sense. There are times when I will go several weeks only writing code and not doing anything creative and I start to feel it. I'll suddenly have the urge to redesign my site or write something. And it works the other way too--after a while without developing applications and purely being creative I will have a very strong urge to sit down and write code. They actually compliment each other very well. It's interesting to see how you break down the different types of work you do. I think it's safe to say that the burn out some people feel in more traditional roles could be attributed to the lack of opportunity to flex their creative muscles. Your situation seems ideal as you get a good mix of both. But back to the subject of designers and developers. As a platform, It looks like designing and developing iPhone apps is a popular move for many who worked primarily with the web. How about you — what made you want to create Ego? Like most of the other applications I've written, Ego was written first and foremost because I needed it. I was sick of checking Mint, FeedBurner and Twitter with several accounts from my phone. It required too many logins, too many tabs, too much time. So I just needed a simple place to look at all my stats in one glance. From that, Ego was born. In addition, I enjoy learning new technologies and designing for new platforms or constraints. I love the iPhone and the new life it gave to mobile design and development and I was excited to give it a shot. And, of course, it would be nice to make a little money here and there. Hmm, there are two interesting items you mention there. First, How difficult was it to pick up Cocoa (or Cocoa touch) and develop this application? What kind of timeframe did it take for you to finish learning and start building the application? I had learned Objective-C (or at least a working knowledge of it) years ago when I wrote xPad. Back then it took me many, many months to learn and develop the app. This time around, I decided to go the smart route and read/learn BEFORE jumping into code. I get so excited about making something that I often jump in too deep and end up struggling to solve problems because I'm not as knowledgeable about things as I should be. So when I decided to write Ego, I bought Learn Objective-C on the Mac (Dalrymple & Knaster) and Beginning iPhone Development (Mark & LaMarche) and read them cover-to-cover over the course of two weeks. During that time, I never touched my computer. I just read and digested. By the time I started working in Xcode, I was much more comfortable with the idea of writing an iPhone app. Start to finish, I think I spent about a month and a half designing and developing Ego version 1.0. If I hadn't refreshed my knowledge of ObjC and read the iPhone dev book, I think it would have been a lot longer. Sharing only what you're comfortable with, how is that going? Do you feel that the iPhone is a viable way for developers to earn a living? Luckily, those two weeks were during a vacation, so it didn't impact me too much. Whether or not it's normal for someone to read ObjC and iPhone dev books while on vacation is another issue, but we'll ignore that one for now. Ego hasn't sold as many copies as I would like, but it was never meant to be a breadwinner. I'm happy that I've sold as many copies as I have to date, and while I would love to wake up one morning and see 1,000 sales from the last day, that's not realistic given how niche the application is. That being said, there is clearly a viable way to make a living through the app store, but I think it is becoming saturated and over time it looks that games might be the only way to get rich doing it. That being said, if I had 5 applications all selling as much as Ego is, I would be pretty comfortable from it. So if you want to send over 4 great ideas, that'd be fine by me. Ha — they're on the way. You mentioned XPad previously, a text editor for OS X that is now freeware. You also mentioned that it took months to make. How hard was it to make the decision to release your hard work for free? Actually, xPad is freeware because it's old. It wasn't free when it first came out. It was $9.99, if I remember correctly. It didn't sell too many copies, but people seemed to love it (I still hear from people all the time that they use it to this day). Then there was an incident when I sold the IP to someone who then backed out of the contract. It's a long and pointless story. When I got it back after a few months, I decided to just make it freeware (I also gave refunds to people who had bought it within the few months before I made it free). By the time it became freeware it had been out for a few years and wasn't really selling anymore so it didn't bother me (and, like I said, people still seemed to like it). When I first released it, I definitely wanted to try to make some money from it, since I had spent about 9 months learning ObjC/Cocoa and developing it. That being said, since xPad I have released other free applications, such as SimpleLog, which was a Ruby on Rails content management system. I've since stopped working on it, but did spend about a year building/designing it which was a lot of fun. Well, I'm glad you brought up SimpleLog as well. I'm curious to hear why, after taking the time to develop your own CMS, you would then switch to a tool like Tumblr? There were several reasons. Initially, it was because the content I was writing for my site had slowed to a trickle. I didn't have as much time to write so I wasn't posting as much. But I would constantly find photos or videos or other things I enjoyed and wanted to post with little bits of thought. SimpleLog was designed for writers. When I created it, I specifically set out to make a CMS that was simple (oy) and efficient for someone to use when writing on their site. I used to write a lot more fiction and such and it worked really well for that. But it wasn't designed for short posts, multimedia posts, or so-called micro-blogging. When Tumblr first came out I started an account and posted little things on the side but didn't link to it anywhere. After a month or two I realized I had posted loads of content there and nothing to my primary site. So it seemed logical to switch. On top of all that, I love the like and reblog functionality Tumblr provides. It makes it easy to find great content and also to get your content circulated around. Plus, the Tumblr folks are nice (and pretty damn smart, too). I hear you there — I'm loving the service and the community. And seeing the whole story, I can see why you moved on in regards to each of these projects. Back to Tumblr. I've been following Prettify since you joined as a member on Fusion. One thing I've always wondered though: why do you write in plural form? Hah. It's amazing how many times I've been asked that. Honestly, I don't know why I did that. I just wrote the first few in plural and it stuck. I guess I imagined in the beginning I would eventually have other people adding content to the site as well, but after a short time I realized (after looking at submissions) that I don't trust anyone else's taste enough to give out control over posting. I thought about switching to singular, but it was already the style of the site. I actually did the same thing in the first few posts of another side-project called That's Not Art, but quickly corrected it. Well, it just adds to the charm of the site. All right, that's enough of Garrett Murray the developer and web savant. Let's talk about your cinematic side. “Forever's Not So Long” was really good. Can you describe the overall experience making the movie was? Filmmaking and acting are my primary passion. Web development is fun and it pays the bills but my real interests lie in film and television. 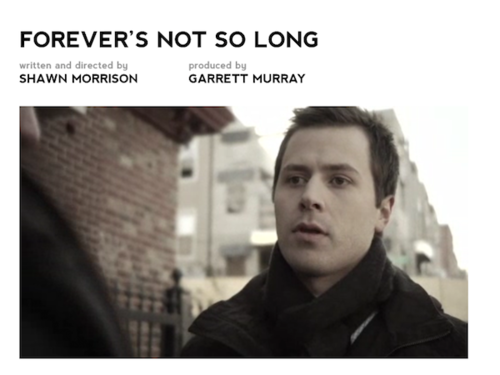 I've been working with my long-time friend Shawn Morrison since we met in college on various comedy vehicles and short films, of which Forever's Not So Long is the latest. When we started talking about making FNSL, we decided for the first time to make a film specifically to send to festivals. We had talked briefly about submitting past films but it was never one of the primary goals until this one. Shawn had written the core of FNSL a few years back when we had talked about another idea that involved it and when we started talking about what to work on in late October, 2008 we both agreed this story was interesting and would make for a nice short. He finalized the script and we shot and edited it during the month of November. Forever's Not So Long was different for us in that it was the first time we shot a short in high definition, and on film lenses. That presented new challenges (very heavy camera that Shawn had to hold, sometimes for a very long time, very precise focusing, et cetera) but ultimately gave us the best visual work we'd done to date. Especially when you consider how wonderfully Shawn shot it. It was also the first film we'd made in which music played a large role. Our friend Robert Andersen wrote a fantastic song called Emperor Norton, which is played over the last few moments of the film and really adds such an amazing amount of weight to the final scene. When I first heard that song a few years back, I knew immediately I'd use it in a film at some point and was thrilled we could use it for this one. FNSL was also an interesting experience for me because it was the first film or content we'd made that I didn't co-direct or co-write. I gave Shawn feedback on the script while he was working on it and a few suggestions during shooting but my role in this project was focused purely on acting. It was, quite honestly, fantastic to have someone else managing those other aspects and to focus on the character and story. Granted, I produced the film so that involved a lot of work, but luckily that was mostly before and after we actually shot it. Coming from someone who knows very little about cinema in general, I have to say that when watching the film, the cinematography and the music definitely added to the feel. And the focus on everyday things. He’s not listed in the credits … was this planned or is he some random New Yorker? Actually, he is in the credits--his name is Jeff Beebe. He's listed along with other people who run by on the street, including Amanda Crater, Sara Zarbo and my kid sister, Ashley Murray (who also did the makeup for the film). You can also find a full list of credits on the IMDB page for the film. Ah, I stand corrected. Thanks for clarifying. Great work by everyone involved. We've touched on your many facets: developer, actor, filmmaker, blogger, podcaster … let's talk about Garrett Murray the entrepreneur. There has been a move towards self employment on the internet the past 4-5 years in which people are actually selling themselves. It sounds somewhat funny to say that, but in essence it's true. Many people want to be the next John Gruber or Merlin Mann. As someone who works for himself, what do you think of this trend? It seems perfectly logical to me. I don't begrudge anyone who is good at self-marketing, especially when they're talented at something (or multiple things). I do get frustrated when people become famous and/or successful when they have no inherent skills other than networking--what's the point of being well known for being useless? The internet has made it very easy to create and broadcast your own brand, but it's still immensely difficult to be successful with it. If your goal is to want to be the next John Gruber, that seems like a waste of time. 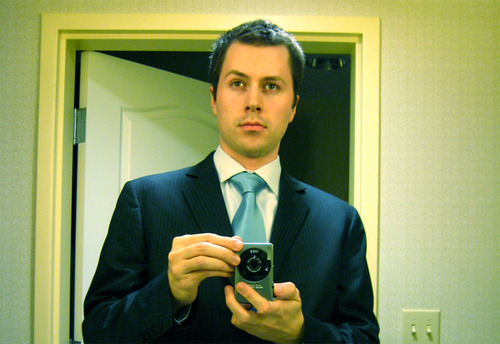 John's goal when he started writing Daring Fireball was to be a great technology writer. There's a big difference there. I definitely fall into the category of selling myself. Between my primary income (web development) coming from referrals and leads based on past work I've done, to building an audience for the sketch show and short films, to the little things like Prettify and That's Not Art, everything is branded with my style and persona. When did you make the move to working for yourself? Have you ever had a more traditional job working for someone else? Oh, I've worked for loads of companies. Just before I started pinch/zoom I worked for a small Seattle-based agency called Blue Flavor. That's where I met Brian Fling, who I work with now. In the past 10 years I've worked for many companies, both large and small. When I left Blue Flavor I decided to make a very serious go of working for myself. Frankly, working in an office, working 9 to 5 … it's just not for me. I like working late at night, I like working in solitude quite a bit, and I enjoy the flexibility of working from my home office. My cats seem to enjoy it too, since they have someone to bother during the day. Blue Flavor — I hadn't realized that. All right then, since you've made the move to self-employment, do you have any “professional” tips for the gads of aspiring entrepreneurs that are looking to go on their own? Always set aside at least 30% of your income for taxes. If you don't, you're screwed come April 15. It's also a good idea to pay the quarterly estimates, although I always forget to. If you need to be around people for most of the day, you're going to have a hard time working for yourself. Most days I don't see people for the majority of the daylight hours. I talk to a lot of people through IM, email and Twitter, but face-to-face contact is rare. If you can't handle it, things won't go well for you. Consider each project carefully before taking them on. What sounds worth the cash in April sometimes feels like a horrible mistake in August. Tons of money isn't a good reason to take a project. Exercise. Since you're not going to be out and about, walking around, you'll gain lots of weight. I gained about 20 pounds my first year. I felt terrible and had to work it all back off. Do yourself a favor and don't let it become an issue by exercising regularly. After all, you set your own schedule so you can run in the middle of the day. Keep every receipt for everything you spend that's related to your business. Meals with clients, travel, everything. You can write it all off, and you'll need to since you're going to be paying self employment taxes. Nice tips, especially regarding taxes. That's something I'm learning here — glad to hear you back it up. All right, I have a bit of a fetish for software and how experts use their tools, as well as personal productivity (I won't use the GTD word). Can you share how you make sure you stay organized and productive? And tell us about some of your favourite software tools that you use? I'm pretty simple about how I stay organized and productive. When it comes to email, I archive what I'm not going to reply to and try to keep my inboxes empty. I file important things into named folders. For files and such, I use a simple system of an inbox for downloads, a pending folder for things that I'm working on temporarily and an archive folder (with many subfolders) for things I'm done with but want to keep around. I also use Dropbox for all my business-related files (sharing with colleagues has never been easier) and filmmaking-related non-video files. I use a Drobo to store all my permanent content (video, older photos, et cetera). For task management, I use Things on the desktop and iPhone. I use Tweetie for managing the various Twitter accounts I run (@garrettmurray, @egoapp and a few others) on the desktop and Birdfeed on the iPhone. I use NetNewsWire for feeds in combination with Google Reader. I do nearly all my work with TextMate, Photoshop CS4 and CSSEdit. MAMP Pro for all my test server configurations for things like PHP and MySQL. I write iPhone apps in Xcode, of course. And I keep all my code (personal and business-wise) in git repositories and host them on GitHub. I try to keep my desktop, inbox and filesystem neat and tidy as frequently as possible, which is just the digital extension of how I keep my apartment. I'm a bit of a neat freak. Thanks to Garrett for sharing his thoughts on the subjects above over the past months. As always, it was a pleasure to get inside the mind of an expert and see things from a more intimate perspective.